ComeOn is a gaming site that is located, licensed and regulated by the European Union member state of Malta. ComeOn was launched in early 2010 but did not get the (EU licensed) sportsbook online until later that year. This newcomer has serious ambitions and the financial backing for players to rest assured that their funds are safe. ComeOn´s live betting coverage is huge. They offer live betting to almost any event you can think of no matter it is televised or not. This includes most of the sports and not limited to football. ComeOn.com also offers a Casino and a Poker room with $600 Welcome Bonus. In their poker room they offer the chance to play against US players which means more fishes than the European audience. The odds and sports are the the exact same as 10bet.com which is a major Asian bookmaker with juicy football odds in particular and many Asian lines. ComeOn promise fast and secure pay-outs through various payment methods. The payout process is very simple and you will usually have your money within 24 hours. Don’t miss out on the 100% match bonus up to €/£77 on your first deposit. ComeOn holds a regular license issued by The Lotteries and Gaming Authority (LGA), Malta. This is a unique combination 100% Welcome Bonus for use in any combination within the Casino or Sports section! The choice is yours! With your first deposit into our Casino or Sportsbook they will match it 100% giving you even more thrills in the Casino, or chances to pick a winner in our Sports section! You need to wager 30 x (your deposit + bonus amount) in order to complete the requirements of this bonus. If you deposit £20, you will end up with a balance of £40, inclusive of your bonus. Hence, you will have to wager 30x(20+20) = £1200 in bets on the Casino games. Open a new account with ComeOn !!! 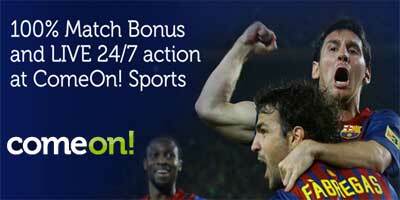 "ComeOn sportsbook review: 100% deposit bonus and LIVE 24/7 action"